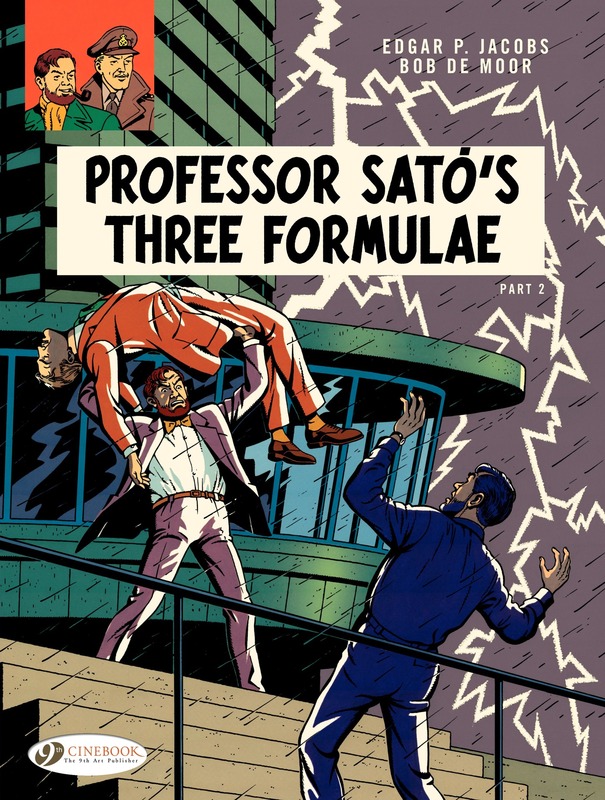 Nineteen years elapsed between the first volume of Professor Satō’s Three Formulae (Les trois formules du professeur Satō) in 1971 and its concluding second half, which was eventually published in 1990. Edgar P. Jacobs died in 1987, sixteen years after he had published volume one. The gaps between adventures had grown ever longer from S.O.S. Meteors onwards, but this was the longest stretch of all. 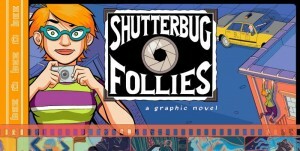 There was no volume two. 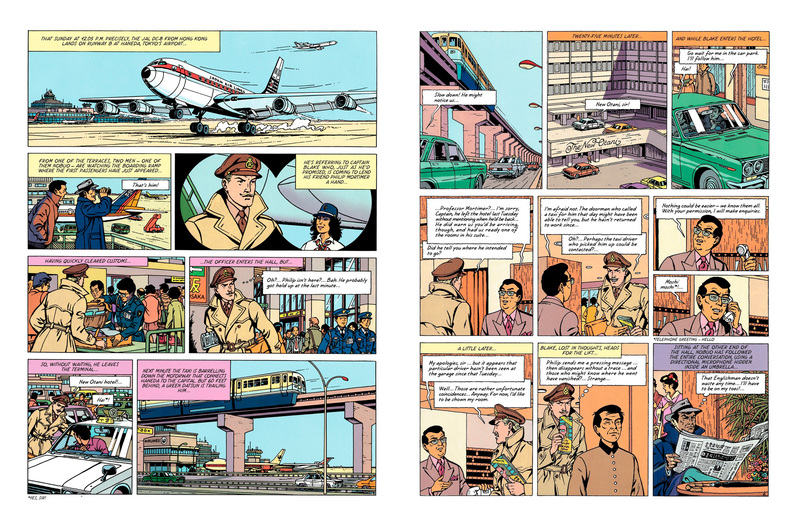 However, he had left behind a script and lots of pencils and layouts, and the Jacobs estate entrusted the job of completing the story to Bob De Moor, who had worked with both Jacobs and Hergé and could duplicate their drawing styles seamlessly. Part one, ‘Mortimer in Tokyo’, ended with a kidnapped Philip Mortimer held unconscious by a giant robot, while Colonel Olrik used an android duplicate of the professor to steal Satō’s formulas. Part two, ‘Mortimer versus Mortimer’ begins with the arrival of Captain Blake in Tokyo. 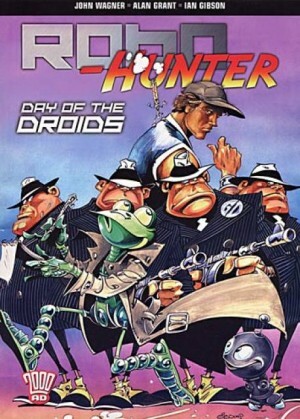 Putting his detective skills to work in the New Otani hotel, Blake immediately figures out what’s going on, but has to contend with Olrik and his gang who are determined to prevent him from rescuing Mortimer. 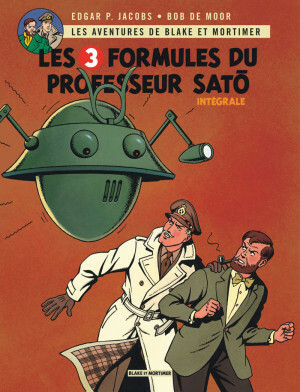 This second half of the story speeds along with plenty of action as Blake and Mortimer separately battle deadly robots and then together find themselves up against a seemingly unstoppable duplicate Mortimer programmed to do only one thing: kill them both. While the artwork does in places resemble a Tintin book more than classic Blake and Mortimer (character heads often seem doll-like, larger in proportion to their bodies than Jacobs’ usual dimensions) the overall style feels appropriate. 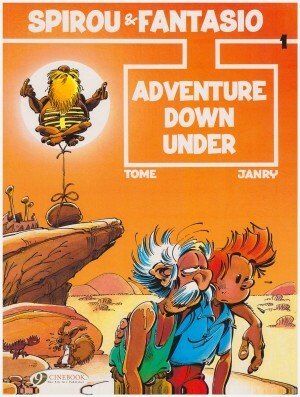 There’s lots of background detail, the action is well delivered and it’s a good finish to this adventure, although the story itself is not up to the level of Jacobs’ best by a long way. At the back of the book, there is a reprint of an essay already featured in a previous Blake and Mortimer volume that gives some background to the making of Secret of The Swordfish, which is an odd decision. 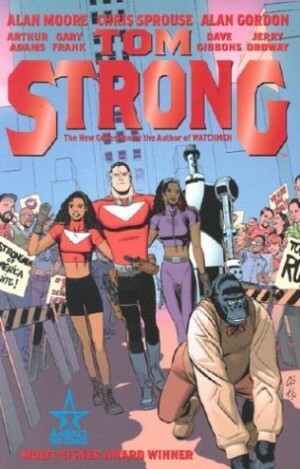 What fans who bought this book would want to know is how Bob De Moor drew this book together from Jacobs’ blueprints. 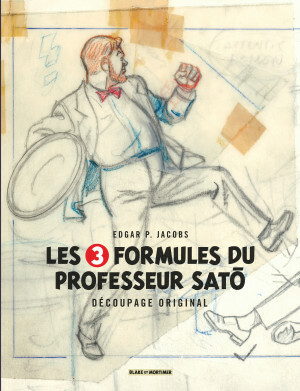 The information is out there in a French collection of all Jacobs notes, pencils and layouts for part two published by Dargaud (3 Formules du Professeur Sato – Découpage original par Edgar P. Jacobs), so if you’re curious about how this volume came together that’s where you’ll find it.